If you’ve been reading my emails over the past couple of weeks, you’ve probably noticed my passion for Feminine Energy as it relates to business. Well, next week my dear friend and colleague Lauren Joyce will be launching a video summit featuring 12 experts who will be sharing about this very subject. This video summit will explore all areas of your life and business with thought leaders, game changers and wildly successful women entrepreneurs. I was interviewed last week and I’ve literally been on fire ever since our time together. I shared my juiciest secrets for how I keep my feminine energy alive in my business so I don’t burn out. I also share a personal story about why I became a business coach (which might move you to tears) along with many other unconventional nuggets of wisdom for moving through fear and procrastination in feminine ways. You won’t want to miss it. The summit starts on November 2nd! Best of all, this summit is FREE! That’s right, you’ll receive 12 video interviews where experts share their knowledge and wisdom for zero dollars. I’ve personally worked with a few of these women first hand and their content and coaching is off the hook. 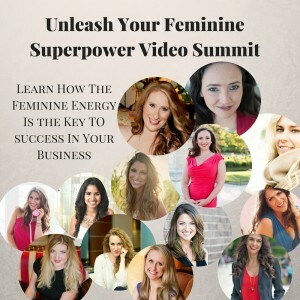 Many of us have heard of feminine energy but aren’t sure what it means or how to use it; especially in our businesses. Over the course of this week you’ll learn the true power of feminine energy and how it can help you attract the success you desire. When a woman is tuned in to her feminine energy she collapses time lines, creates miracles and lifts everyone around her to new levels of greatness.